The McKee Gallery is pleased to announce a ten-year survey exhibition of Daisy Youngblood’s sculpture, opening Thursday, April 2, 6-8 pm, through Saturday, May 30, 2015. Youngblood has produced 14 sculptures over the last decade, in low-fire clay or in bronze cast from clay, all of which will be on view. The work over the last 10 years reflects changes in her approach to making sculpture. 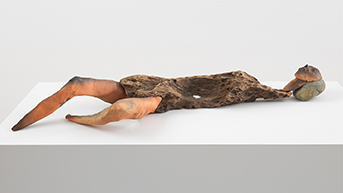 Although she has used pieces of wood in many earlier works, found objects in nature are more decisively incorporated into the clay and the scale has increased. Stones are used as heads, eyes, noses, torsos; a long concave piece of oak is a body. They are all equal parts of a living whole for Daisy Youngblood. The earliest piece in the exhibition is Budhi 2006, a moving portrait in clay of her daughter with Down’s syndrome; then Bear 2007, a gentle spirit in clay; Venus 2007, a fierce crouching figure that could be animal or human, blurring the lines between them; a series of orangutans in motion: Oladio 2009, Leaping I and Leaping II 2010. Anubis and the First Chakra 2012 is a major statement of materials and essence. There are three complex sculptures in different Yoga poses, and lastly, Chandrika 2014, a long reclining figure, seemingly moribund. The strong influence of Buddhism is evident. There is a 40-page catalogue available, with 25 color illustrations and an essay by Constance Lewallen.